Rosewood Hotels & Resorts is owned by New World Development, a Hong Kong hotel-and-property company that's part of Chow Tai Fook Enterprises, founded by the late Cheng Yu-tung. His granddaughter, Sonia Cheng, is currently chief executive officer of Rosewood Hotels & Resorts and leads a team of seasoned industry professionals in the regional and international expansion of the brand. Part of Victoria Dockside, Kowloon's new arts and cultural district at the Tsim Sha Tsui harbour, Rosewood Hong Kong is the global flagship of Rosewood Hotels & Resorts. Other Rosewood hotels in Asia include Sanya, Phnom Penh, Luang Prabang and Phuket. The Rosewood Hong Kong takes up 43 floors of the 65-storey high multi-use tower, with a total of 322 guestrooms (starting at 53 sqm/570 square feet) and 91 suites. With its prime location, over 80 percent of the rooms offer panoramic views of the Hong Kong skyline. The hotel's Manor Club is located on the 40th floor, which offers guests VIP perks including all-day dining, a bar, games room and bespoke experiences. For longer-term stays, there's Rosewood Residences—a collection of 186 luxury accommodations with a separate entrance and access to club facilities on the 53rd floor, including an indoor swimming pool and private gym. The Rosewood Hong Kong was designed by American architecture firm Kohn Pedersen Fox Associates, who also worked on the International Commerce Centre in Hong Kong, Lotte World Tower in Seoul and Rosewood Bangkok. 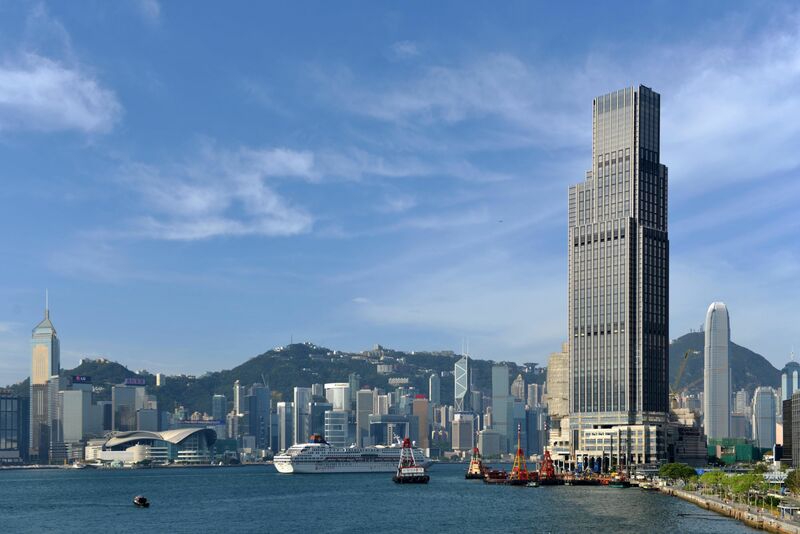 The 65-storey exterior pays homage to Hong Kong's verticality, which explains why the hotel is known as a "vertical estate". Featuring a mix of fabrics and patterns, the interiors of Rosewood Hong Kong are designed by New York-based Taiwanese designer Tony Chi. Having worked on the Rosewood London, Tony is a close friend to the Cheng family who believes that a design experience should be invisible. The Rosewood Hong Kong will have a total of eight dining concepts, many of which offer outdoor terraces to enjoy the Hong Kong breeze. They include Holt's Cafe for elevated 'cha chaan tang' dining, The Legacy House for Cantonese fare and DarkSide for cigars and your favourite tipple. The Butterfly Room is the Rosewood Hong Kong's all-day lounge, while the Butterfly Patisserie will showcase beautiful tiered cakes with artisanal gelatos and sorbets. Stay tuned to T.Dining for more on the Rosewood's F&B offerings. The Rosewood Hong Kong boasts an impressive collection of art, starting with the 4.7-metre-long bronze sculpture at the top of the driveway by Henry Moore. Other standout pieces include a life-sized sculpture of an Indian elephant next to the lobby by Bharti Kher and several butterfly-inspired pieces by Damien Hirst (in the Butterfly Room lobby restaurant). Having debuted at the Rosewood Phuket in 2017, the Asaya wellness concept is also available at the Rosewood Hong Kong—the first to offer it in an urban setting in Autumn 2019. Through a holistic approach, guests will be guided to achieving their wellness goals through healthy eating and fitness programmes paired with alternative therapies. Boasting one of Hong Kong's few landscaped lawns facing Victoria Harbour, the Rosewood Hong Kong will definitely be popular for special events, especially weddings. Besides the giant, pillarless Grand Ballroom of 1,000 square metres, there's also another 1,000 square metres of event space on the fourth floor. There's even a dedicated arrival area for events with an old world staircase, perfect for glamorous group photos and videos as you spiral up the stairs. We were onsite at the Rosewood Hong Kong several weeks ago to photograph Sonia Cheng, CEO of Rosewood Hotels & Resorts, with her father, Dr. Henry Cheng, and several key members of the Rosewood Hong Kong team. Look out for the April 2019 issue of Hong Kong Tatler at your nearest newsstand next month and follow @hongkongtatler for all the latest news on the Rosewood Hong Kong.